In the Valley of Bones DVD, Anna (Autumn Reeser), a passionate but disgraced paleontologist, embarks on a journey through the badlands of western North Dakota in search of a potentially historic fossil. Word reaches Anna that Wes McCoy (Steven Molony), a recovering meth addict with unpaid cartel debts, has stumbled upon a large Tyrannosaurus Rex tooth. Determined to find the bones at any cost and undo her past mistakes, she teams up with McCoy, along with her late husband’s brother and her estranged son, and finds herself entangled in a dangerous game that tests whether she will move on from her past, or be consumed by it. With a strong ensemble cast that includes Rhys Coiro (TV’s “Entourage”), Steven Molony (Oxenfree), Alexandra Billings (TV’s “Transparent”), Bill Smitrovich (TV’s “Grey’s Anatomy”), Muse Watson (TV’s “NCIS”), and Emmy Award® nominee Mark Margolis (Outstanding Guest Actor in a Drama Series, “Breaking Bad,” 2012) and set against the visually stunning North Dakota backdrop, this taut drama unearths non-stop twists and turns that’ll have viewers thrilled to the bone. 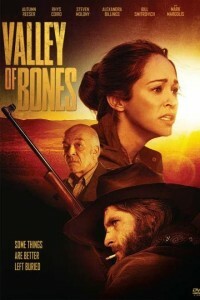 Valley of Bones was written by Dan Glaser (Pinching Penny), Steven Molony (Efficiency) and Richard M. Lewis. It was produced by Jon Wanzek (10,000 Saints), Dan Glaser, Steven Molony, Luke Dylan Taylor (31, Little Men), Janek Ambros (Imminent Threat, 10,000 Saints) and Brandon Heitkamp (Bad Frank, Oxenfree). Executive producers are Jon Wanzek and Brenda Robinson.